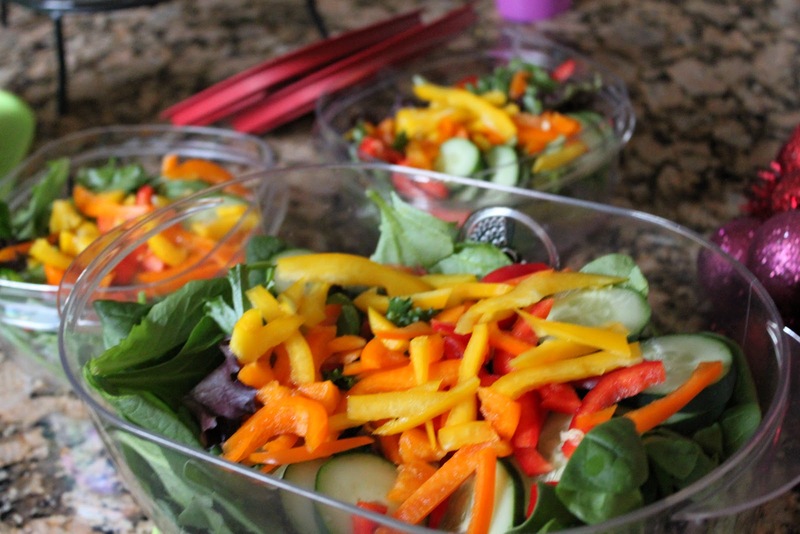 Butler, Party of 4: Diet Tips: A NEW you in the NEW year! Diet Tips: A NEW you in the NEW year! I give a lot of "health &amp; fitness" tips on my lil blog. You may have heard these before, and probably even in some of my previous posts, but I do have some lovely new followers (shout out to the newbies....hey there!). AND it's always good to have gentle reminders. I know I definitely have not eaten like I should over Christmas break. Nice, Danielle....way to practice what your preach (oops!). Anyway, I am getting back on track and thought you'd like to join me. *Water, water, water. Drink more water, even when it's cold. Buy a cute (BPA free) water bottle and keep it with you all the time. If you are one of those people who just doesn't remember, set an alarm on your phone and drink 8 oz. every couple hours. Or have a trigger....take a few drinks every time someone says your name. Water flushes toxins, keeps your organs functioning properly, and is good for your skin, hair, etc. Hydration is super important to good health and promotes weight loss. A lot of times we mistake hunger for thirst, and if we stay hydrated we could avoid some unnecessary snacking. *Veggies are a girls best friend. You have GOT to eat more veggies...and if you hate them, find fun ways to eat them that you will enjoy. No, that doesn't mean add cheese or fry them. I like a little olive oil, garlic, &amp; pepper go a longggg way in cooking veggies. Yum! *Eat yo salad last. Here's a little trick from the French. When you eat your roughage last, you help all your other food digest easier. Here's a hint though, don't load your salad with crazy calories with toppings like cheese, bacon bits, croutons, tons of dressing, etc. Look up recipes for yummy, healthy salads on Pinterest for ideas. Add healthier snacks like nuts, berries, and lowfat cottage cheese if the thought of a plain salad bores you. Oh, and aim for vinaigrettes as opposed to other full-fat dressings. They are a much healthier option, and you can put your dressing on the side and dip your fork in before you take a bite. A little bit of flavor with vinaigrette goes a long way! *Find the healthiest options possible of your favorite foods. Maybe you can't live without cheese, bread, pasta, or pizza. That's fine, but make them as healthy as possible. Choose whole grain breads &amp; pasta (I love Ezekial), lowfat cheese, and make your own pizza at home (or at least order thin crust with lots of veggies). We also like to make whole grain waffles with flaxseed on Sunday afternoons. Yum! *Plan, prepare, and plan some more. Plan your meals and workouts ahead of time. Sundays are my preparation days....I boil 5 dozen eggs, cut up all my veggies and pre-make salads to last me the whole week. I also split almonds and berries into little baggies for perfect portion sizes. When I plan everything out, have a game plan, and prepare foods ahead of time, I'm way less likely to eat junk (like fast food or order pizza) or to skip a workout. I workout a lot harder when I have a plan/goals. *Pay attention to your body and your food. It's amazing what you can learn about yourself when you become aware. Take your time when eating and chew your food carefully. Stop when you feel full. Eat every three hours to keep your blood sugar stable so you never reach the point of 'hunger. 'Wait 20 minutes before getting seconds or a dessert to see if you're still hungry. Drink lots of water throughout the day, before your meal, and as you eat. *Keep a food journal. Online tools and apps like myfitnesspal.com make it super easy to keep track of how much you eat. I discovered that I was eating wayyy more than I thought. Especially sugar. When is saw it written out, I knew I needed to cut back. It'll also help you make sure you're getting enough protein, fiber, etc. *Get your hubby, friends, family, whoever...on board the healthy eating train. It is so much easier for me to stay consistent and on track when the people you spend most of your time with are making healthy choices too. I'm so thankful my hubby eats whatever weirdo healthy stuff I put in front of him. *Focus on your health, not your weight. Weight is just a number and it definitely does not define you. Focus on being strong and healthy. You'll be so much happier if you're content with yourself and are just striving to maintain your health rather than achieve a certain weight. Besides, weight is not really an accurate factor of how good of shape a person is in or how their organs are functioning. *Be careful in allowing yourself to splurge. We all know that moderation is key, but when I allow myself treats, it usually makes me only want more. I'm better off just skipping it all together and choosing another option, like a piece of fruit. Several little splurges really add up too...so make sure moderation is actually moderation and not an every day occurrence. Maybe something in my little list I have for myself here inspired you to start working toward a healthier you!! Good post! I am getting back on track with weight watchers tracking this week. These are good reminders. I already committed myself to drinking more water. I have my big plastic thing next to me now and need go fill it up again! I totally agree with all of these! I had never heard that about eating your salad last... I always eat it first so that I fill up on the good-for-me stuff. I need to boil some eggs so that I can eat them for breakfast too. thanks for the tips!! I'm starting back at the gym ( i am NO fan of working out, so i'm taking classes like zumba instead of running all the time.) so hopefully I can add some much more healthy eating. I have such an addiction to diet coke, but i'm drinking more and more tea to ween off of the coke. You have the cutest stinking running outfits!Such a great post! This is a great list! I didn't know that about eating the salad last. I usually eat the salad first so I get all those veggies in and sort of "fill up" before eating the entree! I always always always have my water bottle with me and I find ice cold water shocks my body awake much better than caffeine does! You make me want to be healthy! It's hard being pregnant right now b/c everyone is working out and eating healthy and I'm just getting bigger. I am beyond blessed to be having another baby but after Bennett gets here I am jumping on the healthy wagon. :) Thanks for the preggo comment on my post-you'll be just as gorgeous when you do get preggo! Are there any books you recommend I get and read on how to start being healthy. I'm weird on food so I need the most basic eating healthy tips (like I don't do oatmeal, drink milk, wheat bread...but I do love veggies and fruit if that helps). Oh and wow about 5 dozen eggs...that total is amazing! Get Yo GAME FACE On….26.2 #2! Now I feel better. And Real Age Test. Last Day to VOTE...Refuel with Chocolate Milk! Wait Upon the Lord…& Update on Brock! 2011 Goals…How did I do? ?